When transporting hazardous waste, you must sign by hand and carry a Uniform Hazardous Waste Manifest. 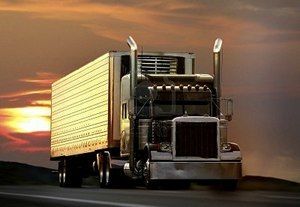 The name and EPA registration number of the shippers, carriers and destination must appear on the manifest. Shippers must prepare, date and sign by hand the manifest. Treat the manifest as a shipping paper when transporting the waste. Only give the waste shipment to another registered carrier or disposal/treatment facility. Each carrier transporting the shipment must sign by hand the manifest. After you deliver the shipment, keep your copy of the manifest. Each copy must have all needed signatures and dates, including those of the person to whom you delivered the waste. Attach the appropriate placards to the vehicle before you drive it. You are only allowed to move an improperly placarded vehicle during an emergency in order to protect life or property. Easily seen from the direction it faces. Placed so the words or numbers are level and read from left to right. At least 3 inches away from any other markings. Kept clear of attachments or devices such as ladders, doors and tarpaulins. Kept clean and undamaged so that the color, format and message are easily seen. The amount of hazardous materials shipped. The total weight of all classes of hazardous materials in your vehicle. Always make sure the shipper shows the correct basic description on a shipping paper and verifies that the proper labels are shown on the packages. If you are not familiar with the material, ask the shipper or contact your office. If the words INHALATION HAZARD are on the shipping paper or package, you must display POISON INHALATION HAZARD or POISON GAS placards as appropriate, in addition to any other placards needed by the productʼs hazard class. 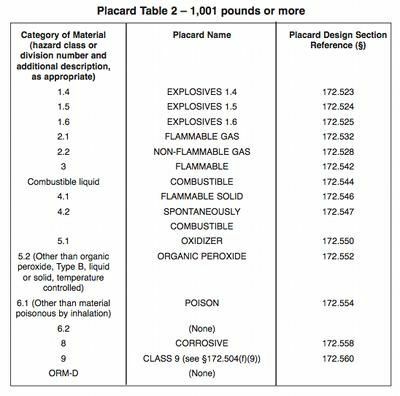 OXIDIZER placards are not required for Division 5.1 materials on freight containers, unit load devices, transport vehicles or rail cars also containing Division 1.1 or 1.2 materials and placarded with EXPLOSIVES 1.1 or 1.2 placards, as required. For transportation by transport vehicle or rail car only, an OXIDIZER placard is not required for Division 5.1 materials on a transport vehicle, rail car or freight container also containing Division 1.5 explosives and placarded with EXPLOSIVES 1.5 placards, as required. A NON-FLAMMABLE GAS placard is not required on a transport vehicle containing non-flammable gas if the transport vehicle contains and is placarded with FLAMMABLE GAS or OXYGEN placards, as required. Placards used to identify the primary or subsidiary hazard class of a material must have the hazard class or division number displayed in the lower corner of the placard. Placards may be displayed for hazardous materials even if not required so long as the placard identifies the hazard of the material being transported. 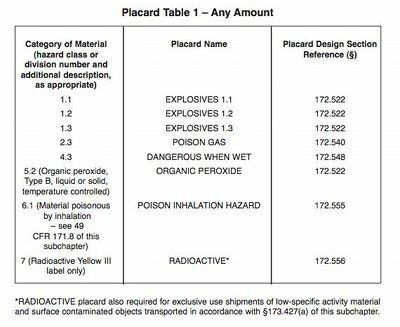 *RADIOACTIVE placard also required for exclusive use shipments of low-specific activity material and surface contaminated objects transported in accordance with §173.427(a) of this subchapter. You may be asked on the written exam when a hazardous materials vehicle may be driven without placards. The only time you may do this is in an emergency. Always keep placards at least 3 inches away from any other markings. This is an enforceable regulation. This is the second time we've seen this list already and questions are very frequently asked from the below list. You should definitely memorize it! You do not need to memorize the entire tables shown below. However, you should probably memorize the the "Placard Name" column. That way, you'll know which materials will require placards with any quantity, and which materials only need placards when 1,001 pounds or more are hauled. Make sure you have a solid understanding on when you can legally use a "DANGEROUS" placard. You may be asked a question about when you can properly display this placard type. We've now seen this statement twice. Any repetitive information is usually important to remember. So pay particular attention to this. You do not need to memorize this entire table. But it's a good idea to be familiar with the "Placard Name" column so you know which hazardous materials require a placard when hauling any amount. Like the table above, you do not need to memorize the entire thing. Pay particular attention to the "Placard Name" column so that you know which materials only need a placard when 1,001 pounds or more are hauled. Make sure you grab an extra placard or two before leaving a shipper in case one of your placards blows away. The hazard class of materials. Which of the following only needs a placard if 1,001 pounds or more are shipped? Which of the following hazardous materials must be placarded no matter what quantity is being carried?